Betway is a name synonymous with online gaming, predominantly casino but also offering poker as well as sports betting too. It came as no surprise to find that in July 2014 Betway Bingo was launched. 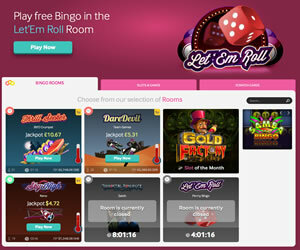 When we landed on the page for the first time we were quite impressed with the bonus offered for new players at the time of launch (£15 no deposit required), not so much with the overall design because whilst it advertised the bonus quite clearly – little else could be seen showing what the brand had to offer. Betway Bingo is powered by the Microgaming software, better known for their impressive casino offering than being top of the game for bingo. Registration was a pretty painless process with the usual information required; choose a username, enter a few personal details like your address and phone number before choosing a password. Submit your details and you have an account with Betway Bingo. You are then asked if you wish to ‘Claim your deposit bonus’ or ‘Play Bingo’. We registered our card details and then clicked play bingo. We were taken straight to a bingo room but unfortunately could not use our bonus to buy tickets on the first game; it was a cash game only. The following game, we could only buy six tickets so whilst the bonus looks great on paper – there are a number of restrictions to the deal. The bingo gaming experience is the same as at any other Microgaming brand, this includes the rather annoying audio pre-sets. 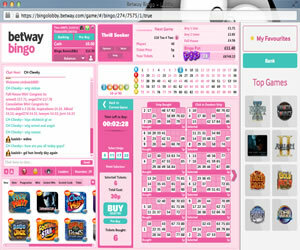 There are just two versions of the bingo game available at Betway Bingo, 75 ball and 90 ball. What the site lacks in bingo variants or room numbers, it certainly makes up for with its instant win games and of course, there is Immortal Romance Bingo if you are looking for a themed game. We couldn’t find details of any promotions at the time of writing the review but this could be attributed to the fact that the brand had just launched. We are guessing that the standard promotions that you find at Microgaming sites are going to be offered at Betway Bingo. These usually consist of an array of additional bonuses for game winners and a jackpot game or two – not anything overly exciting. Betway Bingo is what we expected; a new addition to Betway but not one we think is going to be shown as much love or attention as the casino, poker or sports. 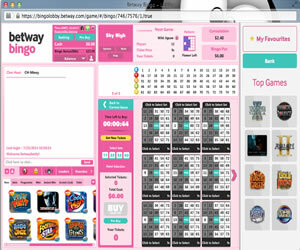 In summary, if you like Microgaming bingo then you will love this site and with £15 free on offer, you’ve nothing to lose by trying it out even if you cant buy many tickets per game with the free money. 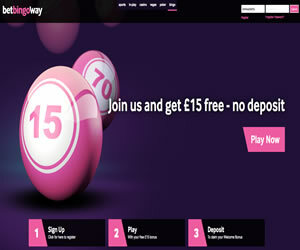 Betway Bingo currently only offers two versions of the game online; 75 and 90 ball bingo. They also boast a themed bingo game based on one of the Microgaming slots, Immortal Romance Bingo. What this brand lacks in bingo variants, it more than makes up with in instant win games. At the point if writing the review the information about wagering requirements was not readily available at Betway Bingo. At other sites these are usual 2x the amount of deposit + bonus received with restrictions in place that you cannot withdraw until 14 days after registration.